Reebok CrossFit Nano 5.0 - To Buy or Not in Apr 2019? The CrossFit line of Reebok has been releasing shoes dedicated to training since 2011 when the current format of the CrossFit Open, Regionals and Games began. In their 5th version, the brand launched the Reebok CrossFit Nano 5.0 which really makes the effort to incorporate the feedback from the top CrossFit athletes over the past years. The Reebok CrossFit Nano 5.0 is a lightweight training shoe designed to last and to give you the best experience during your cross fit sessions. The shoes are very flexible and have a very precise anatomical design, both features provide a sock-like feeling. The Reebok CrossFit 5.0 is well-known for its attractive and stylish properties. The Reebok CrossFit 5.0 outsole is designed to ensure superior grip and slip, regardless of your training technique. The highly abrasive and extra resistant RopePro carbon rubber material used in the outsole makes the shoe extra durable. The asymmetrical design, one with molded lines on the medial side, adds extra grip to withstand the most demanding CrossFit maneuvers. The raised lug brings perfect control and traction during lifting weight. The smooth lateral side helps you descend the ropes more efficient. You can rely on the outsole of the CrossFit 5.0 during the most demanding of the sessions. The polyurethane material of the NanoShell midsole from the Reebok CrossFit Nano 5.0 offers the elasticity of rubber and the toughness and durability of steel. The compressed model EVA midsole adds support during your cross fit sessions. The padding is effective and provides good support especially during box jumps, the shoes absorb the impacts very easily, the rebound compression foam midsole adds responsive cushion and a protective wrap for stability. The remarkable upper construction, built with Kevlar, of the Reebok CrossFit Nano 5.0 proves the best durability you can have. The DuPont Kevlar infused mesh upper also give you good airflow. The lace loop built into the tongue keep the tongue in place all the time if used correctly. Reviews claim that the nonexisting padding in the tongue makes the shoes a bit uncomfortable to wear during creating cross fit activities. The Reebok CrossFit Nano 5.0 is not the best option for fast runs. It weighs about 9 oz for men and 8 oz for women. The shoe isn't a performance shoe but does offer overall comfort. It's a great option for demanding CrossFit workouts. Reviewers were pleased with the shoe's weight and found it great for intense training at their favorite CrossFit gym. The DuPont Kevlar infused mesh upper from the Reebok CrossFit Nano 5.0 is durable, extremely protective but also ventilates well. Reviewers had many nice things to say about the shoe's breathability. The upper regulates temperature well. The Reebok CrossFit Nano 5.0 is designed to provide a lot of comfort, even when training on hard surfaces for a long period of time. The compressed model EVA technology, provides a nice combo of energy-efficiency and ample midsole cushioning without adding on extra heft. The polyurethane NanoShell was incorporated to provide protection and support during heavy lifts, making sure you get the best performance of the shoe while ensuring you're well-protected. Some reviewers have noticed that the shoe can be too wide, and while wearing socks with it, you can experience some friction and hot spots while running. Have in mind the Reebok CrossFit Nano 5.0 are not designed to run in them. Customers love the look of the Reebok CrossFit Nano 5.0. The DuPont Kevlar infused mesh upper gives them a tough look that many customers have found excitingly attractive. The hues offered will make you look amazing while you train. The great style and the outstanding design and comfort they provide, make them as well perfect to be on the top of the list of training shoes that you can wear as well every day during all your activities. The Reebok CrossFit Nano 5.0 is constructed with CrossFit Nano 5.0 technology. This component ensures the shoe is very durable. In addition, the upper is outfitted with DuPont Kevlar which is an extremely durable material. You can treat the shoes the toughest possible way and they will take it through just fine. The elite-level abrasion protection from the Kevlar mesh upper gives you the best durable performance even while climbing on ropes as part of your cross fit sessions. The polyurethane NanoShell also brings extra protection against midsole abrasion. These are highly durable shoes. The protection provided by the Reebok CrossFit Nano5.0 is good. The materials featured in the midsole will protect you from the impact on every movement performed during your WOD. The CrossFit Nano 5.0 incorporates a footbed and heel counter that are molded for a more natural fit that helps secure the foot, making sure you get all the support you need to be protected from injuries from bad movements. The rebound compression foam midsole the shoes features, provide a great responsiveness and cushion while offering a more protective wrapped fit for better stability. The various components that make up the Reebok CrossFit Nano 5.0, provide you with good control while training indoors and outdoors. These shoes incorporate RopePro, which is a carbon rubber compound that is specially designed to give you the best responsiveness while doing your toughest rope climbs while cross fit training. The shoe is shaped in such a way that it provides a glove-like fit, enhancing the responsiveness of the shoe while training. As the shoes are designed to provide the best performance while cross fit training, the responsiveness of the Reebok CrossFit Nano 5.0 decreases when running. Reviews from customers make sure to let you know there are not the best shoes if you are looking for running shoes. On the other hand, for climbing ropes, the Reebok CrossFit Nano 5.0 perform amongst the top cross fit shoes in the market. If you are new to CrossFit training, you should understand the basics of it. Cross fit is comprised of various exercises which are alternated between at high tempo and intensity. Cross fit is a very intense way of training, with routines that are based on high-speed movements, many of which reflect some more intense aspects of weightlifting, running, gymnastics, rowing and more. The last aim of cross fit is to generate a broad, general and inclusive fitness in your life. As cross fit is that intense you need the proper gear that can support that kind of activity. The Reebok CrossFit Nano 5.0 is a shoe designed for that kind of movements. They have a fairly aggressive outsole that increases the surface contact, improving overall grip, a MetaSplit expansion for optimum balance, and a rebound compression foam midsole that makes the shoes responsive and a protective generating better stability. The Reebok CrossFit Nano 5.0 are shoes that are not only efficient in gymnastics and cardio exercises, but also in heavy barbell lifting. These are not shoes for running. The reinforced Kevlar mesh upper and the RopePro rubber will make sure to provide you the best performance while doing rope climbing. The supportive construction and energy return are perfect for CrossFit type activities. The shoe is also well ventilated and will wick sweat away no problem. You can use them indoors and outdoors. The Reebok CrossFit Nano 5.0 training shoes are priced at $50 USD at its lower end and can go up to $240 USD at some online retailers. On average the shoe costs about $140 USD for men and $90 USD for women. The shoes are priced a bit higher than other similar shoes. 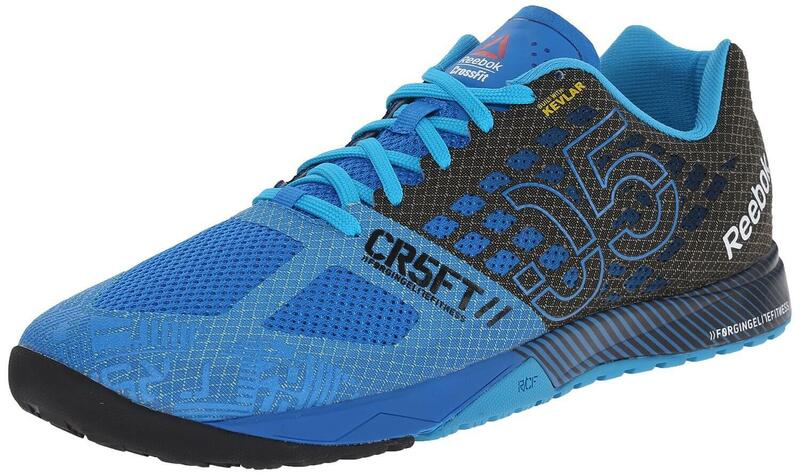 Overall, the Reebok CrossFit Nano 5.0 are good shoes to consider when you are looking for cross fit shoes that bring you stability, that is super durable. The raised outsole lug pattern of the Reebok CrossFit Nano 5.0, was made to increase the surface area and improve the traction and grip while doing cross fit training. As the shoes were designed to have an outstanding performance for climbing, they incorporate their carbon rubber compound to withstand demanding CrossFit rope climbs. The Reebok CrossFit Nano 5.0 shoes incorporate good cushioning and great protection technology while providing good flexibility, but are not the res flexible shoes according to the reviews. You can stay safe and comfortable during your toughest cross training session thanks to the versatility of these shoes, though. The durable carbon rubber outsole, the MetaSplit technology, and the outstanding NanoShell midsole make the Reebok CrossFit Nano 5.0 adapt to the terrain and the runner, especially if you find yourself climbing ropes as part of your cross fit session. You will experience great stability. The Reebok CrossFit Nano 5.0 training shoes have a 3 mm drop for both men and women lines. That specific drop is very useful to help you improve stability during any WOD. The 5th generation of the CrossFit Nano features a reinforcement with DuPont Kevlar to be indestructible for every WOD (Workout Of the Day), the Reebok CrossFit Nano 5.0 was tougher and more stable, yet still lightweight. The more aggressive outsole pattern allows better traction while their carbon rubber build helps to withstand the most challenging CrossFit maneuvers. The shoes are almost flat, the heel to toe drop of 3mm improves stability during the most intense training evolutions. The Reebok Nano line has been one of cross fit trainers favorites since their release in 2011. The Reebok CrossFit Nano 5.0 bring the cross fit shoes to a new level in terms of durability, style and performance, especially for rope climbing. The amazing DuPont Kevlar mesh upper bring extra durability to the shoes making them almost indestructible. The CMEVA midsole and the NanoShell technology bring good cushioning and good stability.